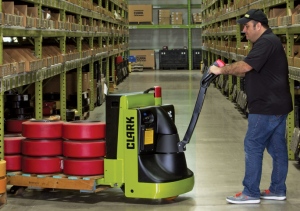 This walkie/rider pallet truck has a 24-volt battery with a 100% AC electrical system that’s enclosed for its protection and increased efficiency. The lift capacity of 4,500 lbs. is fits most applications. Used as a walkie or pallet jack, its perfect for unloading and loading trailers. 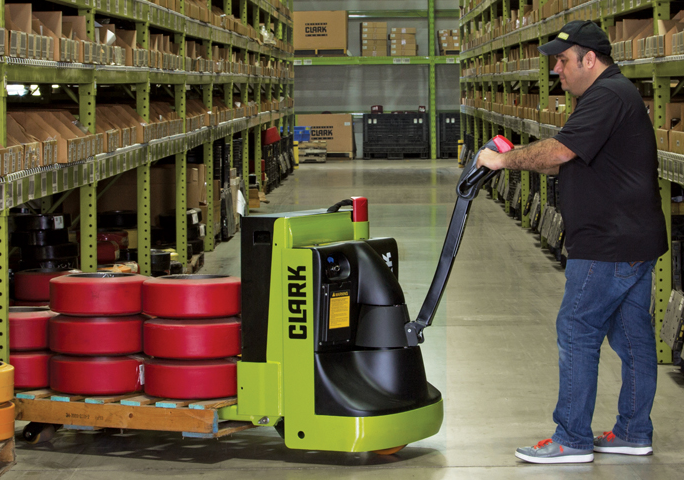 Use it as a rider pallet truck to efficiently move pallet loads from the dock to other areas ofyou’re your warehouse. 24-volt AC inverter and matching drive motor that provides travel control and high performance throughout the entire speed range. Travel speed remains constant relative to throttle position regardless of load. Neutral braking offers predictable performance. Electromagnetic brakes are mounted on the motor armature shaft multiplying the braking power through the transmission. The top-mounted brake design keeps the brakes away from contamination. The parking brake is automatically applied when the truck stops and the handle is released. The system features anti-rollback and neutral braking. Optimized gear technology increases efficiency, reduce noise level, and increases performance. The vertical drive motor is directly mounted to the gear housing, increasing component life. The oil-bathed hypoid bevel gear drive train with tapered roller bearings transfers power to the axle. Solid steel tubing arm and the handle is designed to outlast cast aluminum or plastic designs. Travel, lift and lower functions all accessible without the operator having to lift a hand from the handle. Wrap around steel guard, reversing switch, thumb control, and horn are standard. Minimum steering effort is needed with the low mounted tiller arm that offer excellent operator comfort.